Shares in Ranbaxy Laboratories jumped as much as 11% after the U.S. Food and Drug Administration confirmed it had given approval to the drugmaker to make the first generic version of the cholesterol-lowering drug Lipitor. The US Federal Reserve, the European Central Bank and the central banks of Canada, Britain, Japan and Switzerland said in a joint statement on Wednesday they had agreed to provide cheaper dollar funding. “The coordinated move by the central banks yesterday has improved sentiment for risky assets across the globe," said Kaushik Dani, fund manager with Peerless Mutual Fund. “The hope is this will result in rise in liquidity flow in the near term." Foreign funds are net sellers this year of about $527 million of Indian shares as of Tuesday, compared with a record investments of more than $29 billion in 2010. 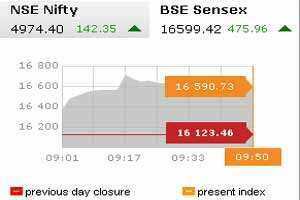 The main 30-share BSE index was trading up 2.72% at 16,561.43 by noon, after surging 3.7% in opening deals. All but one of its components gained. Shares in ICICI Bank, India’s No. 2 lender, rose as much as 8.9% to their highest level in two weeks, helped in part by a Morgan Stanley report that said the stock would rise in absolute terms over the next 15 days after the recent underperformance. ICICI had dropped 23.5% in November, compared to a nearly 9% drop in the benchmark index. Maruti Suzuki, the country’s largest car maker , gained 2.2% to 993.50 rupees after an 18.5% drop in November vehicle sales were in line with expectations and better than a 53% slump in October. Rival Tata Motors was trading 6.1% up at 183.40 rupees ahead of its monthly sales numbers. Energy major Reliance Industries and software services bellwether Infosys rose 3.2% and 2.5%, respectively, on institutional buying amid increase in appetite for risky assets, dealers said. Ranbaxy, the country’s top drugmaker by sales that is majority owned by Japan’s Daiichi Sankyo, pared gains to 4.7% at 455 rupees. The 50-share NSE index was trading up 2.65% at 4,960.35 points. In the broader market, there were nearly five gainers for every loser on strong volume of more about 260 million shares. Analysts said there were doubts about sustaining the rise because of domestic headwinds such as sharp economic slowdown and uncertainty over the fate of crucial reform proposals. The euro zone debt crisis also was a concern. India’s manufacturing sector expansion slowed in November as factory output grew at its slowest pace in nearly three years although export demand should provide some cheer for factories, a survey showed on Thursday. The BSE index, which fell 8.9% in November, is down more than 19% this year to be among the world’s worst-performers. “Fundamentals have to take priority sooner than later, and they have not changed much. The domestic growth scenario, for one, is not looking very positive," Dani said. Data on Wednesday showed Indian economy grew 6.9% in the last quarter, its weakest pace in more than two years, and economists suspected the pace of growth may languish at seven% in the coming quarters. Proceedings in parliament have been abruptly called off every day so far since the session started last week as the opposition demand rolling back of a plan to open up the $450 billion retail sector to foreign supermarkets. Hindustan Dorr Oliver was up 5.2% at ₹ 25.10 after it got an order worth ₹ 170 crore to set up an effluent collection and treatment system for ONGC Petro’s petrochemical project in Dahej, Gujarat. Software services provider MphasiS fell as much as 1.5% to ₹ 320 after its net profit for the fiscal year ended November fell 25% to ₹ 820 crore.